The White Helmets, founded to rescue victims trapped under the rubble of buildings destroyed by Syrian and Russian bombing, have become a favorite source for Western news media covering a story on Russian-Syrian bombing. Portrayed as humanitarian heroes for over the past year and even nominated for a Nobel Peace Prize last summer, the White Helmets have been accorded unquestioned credibility by journalists covering the Syrian crisis. In the video he made the night of the attack, Selmo had already claimed that Russian aircraft fired S-5s at the site, although he mistakenly called them “C-5s.” And a photograph of two S-5 missiles was also distributed to Bellingcat and to news organizations, including the Washington Post. Selmo insisted to Timemagazine that the airstrikes were divided between barrel bombs and missiles fired by Russian jets. Following this dramatic statement, Western media continued to cite Selmo as though he were a neutral source. 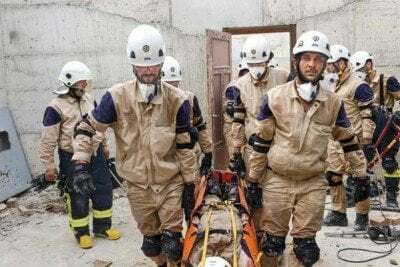 On September 26, Reuters went back to the White Helmets working under him again, citing an estimate by unnamed “civil defense workers” in Aleppo — which could only mean members of the White Helmets — that 400 people had already been killed in less than five days of bombing in and around Aleppo. But after three full weeks of bombing the United Nations and other agencies estimated that 360 people had been killed in the bombing, suggesting that the White Helmets figure had been was several times higher than could be documented by non-partisan sources.